Summary: Motivated by a desire to have opportunities for professional development for their teaching colleagues similar to those they had experienced as participants in the Kennesaw Mountain Writing Project, teacher-consultants created a structure for building a school-based professional leadership development project. 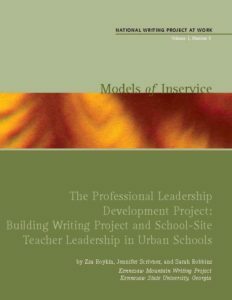 The authors of this NWP monograph describe a flexible model–grounded in participating teachers’ own collaborative inquiry into their work–for promoting teacher leadership within six urban schools. Teacher leaders interested in developing similar models of school-based learning communities will find inspiration in this resource along with a useful planning guide. The model for this work was developed by a group of six teacher-consultants who first attended a Project Outreach summer institute and then became our local Project Outreach leadership team. This group wanted colleagues in their home schools to have opportunities for professional development similar to the one they were having as members of the KMWP Project Outreach team. So working as a team, these teacher-consultants gradually created a structure for building a school based inservice project, called a professional leadership development project (PLDP), with a relatively small group of colleagues in their own schools. This meant that at the same time this team was working as a Project Outreach leadership team and also as a study group that met regularly at Kennesaw State, each member of this six-person team also collaborated with her own school-based study group, action research team, or similar professional development activity group. Each of these school-based groups chose a focus, designed a professional leadership development project with goals relevant to its particular school, and carried out that project.